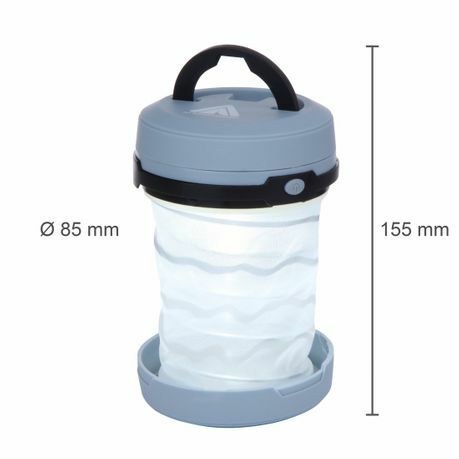 This high-quality camping lantern is perfect for all outdoor activities from picnics to camping, climbing or on the balcony. With 100 lumens of luminosity and a beam angle of 360 degrees, the pop-up lamp with nylon fabric is used as a practical table lantern. 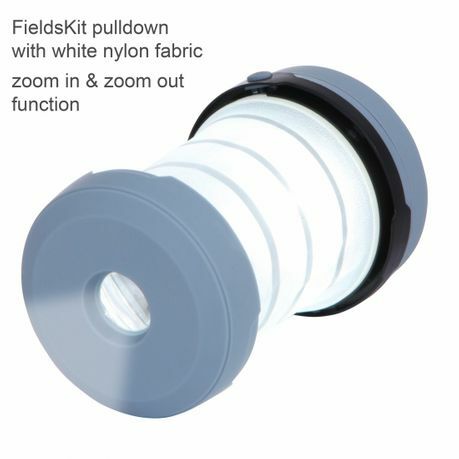 Folded together, the high quality PMMA lens bundles the light and turns the all-rounder into a torch. The light beam thus reaches a range of more than 30 metres. The robust ABS plastic of the housing offers high protection - thus the lamp is shock-proof from free fall of up to one meter height. It is also adequately protected against splash water and classified according to IPX 4 standard. Choose between 3 modes: Normal mode (100 lumens), Energy Saving mode (50 lumens) and Emergency mode (flashing light). Depending on the mode, the lamp lights up to 4 hours. The high-quality LED has a service life of more than 50,000 hours. The fold-up handle guarantees comfortable wearing comfort. In addition, it serves as a point of suspension on a hook or carabiner. Three AA batteries or rechargeable batteries supply the luminaire with electricity - these are not included in the scope of delivery. Thanks to the ingenious, collapsible construction, the lantern can be stowed away very space-savingly. A great gift for every camper and craftsman. 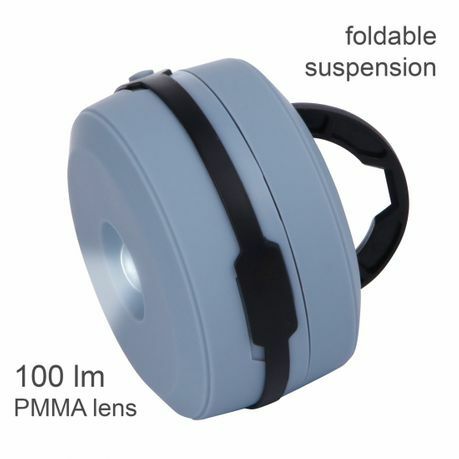 Folded together, the high quality PMMA lens bundles the light and turns the all-rounder into a flashlight. The light beam thus reaches a range of more than 30 metres. Select from 3 modes: Normal mode (100 lumens), Power save mode (50 lumens) and Emergency mode (blinking light). 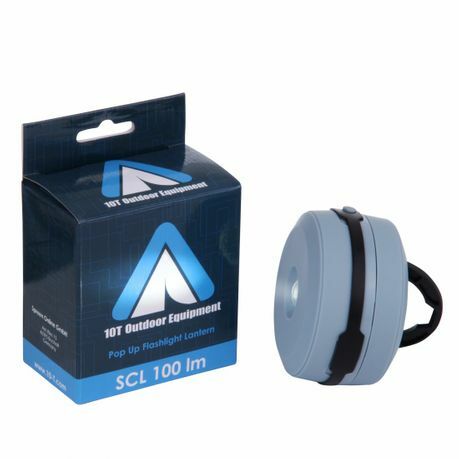 Whether at home, in the car, in the workshop, at work, in the office, in sport or when travelling - this mobile luminaire convinces with its high-quality and stable workmanship. 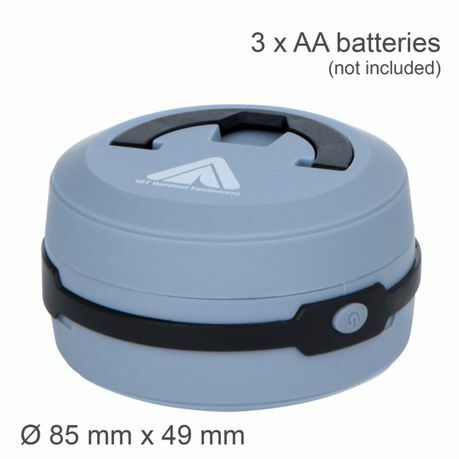 Three AA type batteries or rechargeable batteries supply the luminaire with power - these are not included in the scope of delivery.The batteries are located inside the housing after the lamp cover has been screwed on. 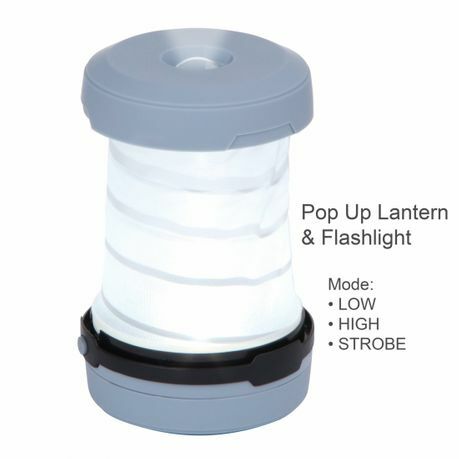 Foldable Pop-Up Lantern / Flashlight | Indoor & Outdoor | 100 Lumen Luminosity | 1 Watt Power | LED | 4 Modi: Normal Mode (100 lm) - Energy Saving Mode (50 lm) - Emergency Mode (flashing) - OFF. 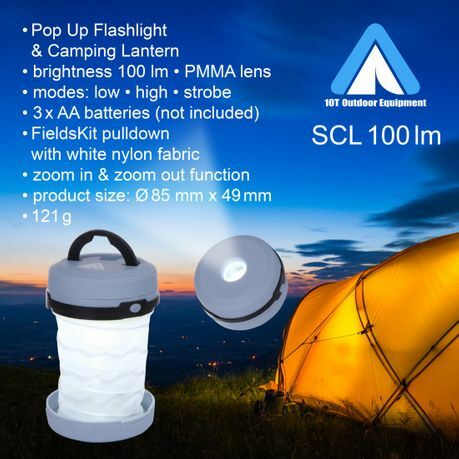 Power supply: 3 AA batteries / rechargeable batteries (not included) | 2 in 1 Concept: Lantern & flashlight (PMMA lens) in one | extremely handy & space-saving. 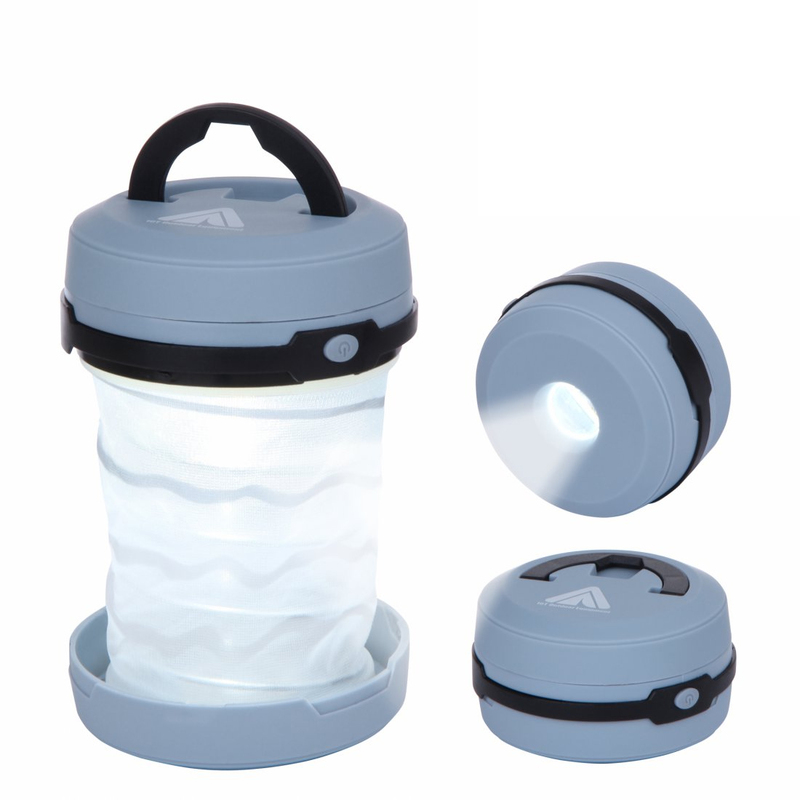 As table lantern: beam angle of 360 degrees illuminates large area | folded as flashlight: the lens focuses the light beam & headlamp range over 30 meters. 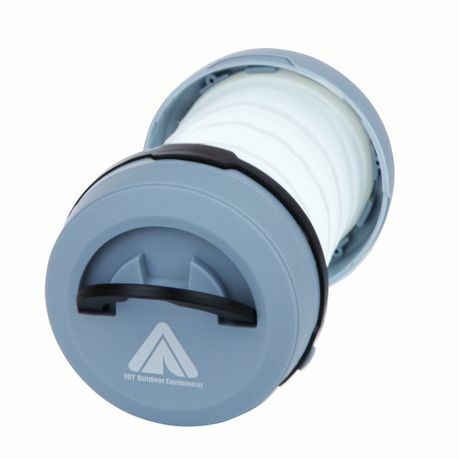 The ABS plastic housing is robust and shockproof up to a free fall from a height of 1 metre | safe against splashing water from all directions and classified according to IPX4 standard. Small table lamp for home & travel with a diameter of 8.5 cm and a height of 4.9 cm (without handle) | more than 50,000 hours lifetime of the LED | lamp lights up to 4 hours.